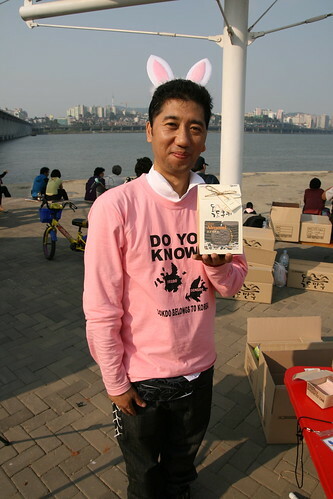 Paul Ajosshi: Do you know Dokdo... Cookies? 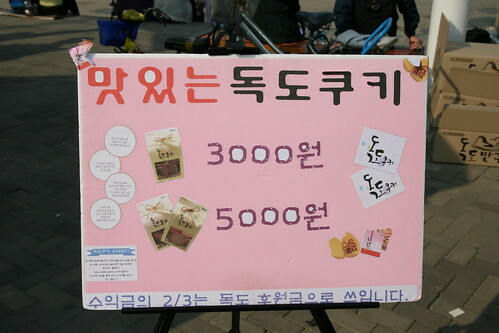 Down by Jamsu bridge at the Hi Seoul Festival yesterday I noticed a small stall selling cookies. 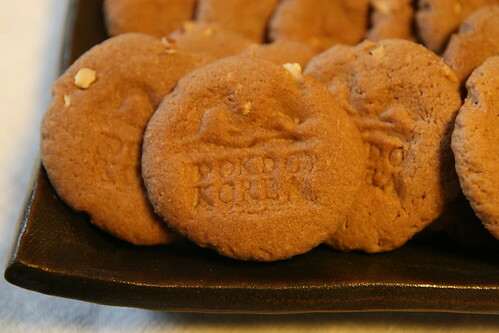 Not just any cookies... Dokdo cookies! 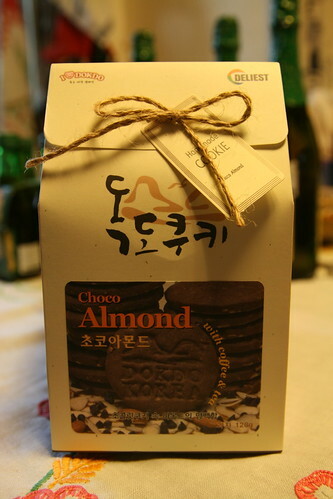 Yes, for the small price of 3,000 won (or 5,000 won for two packs) you could show your love for Dokdo through the purchase of handmade baked goods. Who could resist? Nice look! He then told me to wait so he could get a better piece of headgear. 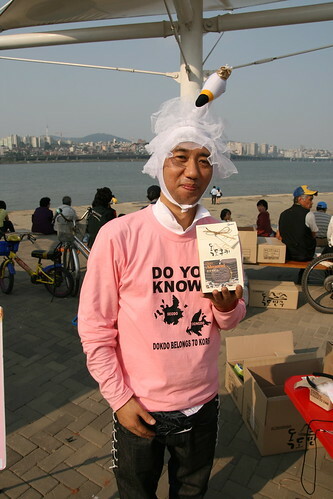 So this is what a supporter of Dokdo is supposed to look like? If so, I need to join up! He seemed very keen, friendly and obviously enjoyed his job. But what about those delicious cookies? And to top it all they taste quite nice! Everything you need to let your guests know that you know what Dokdo is and who it belongs to. I know I'll be serving them at my next tea party... along with my Takeshima toasted sandwiches and my Liancourt rock cakes. 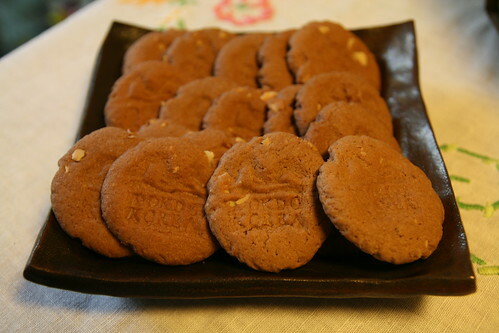 and here I was hoping the dokdo cookies would look like mud-pies, with one larger than the other, shaped like the actual islands. sign. a little disappointed here. my favorite were dokdo cigarettes. Paul...you must invite me to that tea party. I'll be sure to bring along my favorite drink, East Sea Punch, along with some Sea of Japan brewskies. That fellow is a very very famous .. self-promoter. He's tried to mix himself with all the main movements. I've seen him and met him at numerous events in Seoul over the years. He even had one of those "Human Theater" documentary teams follow him around and speak with his family. He bragged that he hadn't had a job in a decade... etc. But don't get me wrong, his heart -- however nationalistic and opportunistic -- is in the right place. Posting pictures of the cookies on facebook is fine. Thanks for asking!